CEREC stands for Chairside Economical Restoration of Esthetic Ceramics. The name is quite a mouthful, but CEREC is essentially a system that allows our team to offer advanced, high quality dental restorations in just one appointment. At Friendswood Dental Group, we’re dedicated to investing in the latest dentistry technologies in order to offer our League City patients the most convenient, comfortable, and effective treatments possible. 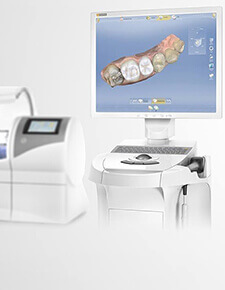 CEREC is just one more way we are able to do just that. Contact our team any time to find out more about CEREC or schedule a consultation today. Traditional crowns and other dental restorations require two appointments. One for the preparation of teeth and one for the placement of dental crowns. CEREC allows us to complete both steps in just one appointment. First, we carefully prepare the tooth removing any damaged dental structure. Then, we use the computer assisted design and manufacture (CAD/CAM) system to capture digital dental impressions. These impressions are quicker and easier to capture than traditional bite impressions, and they offer more precise results accessible immediately from our in-office milling unit or to share with a trusted dental lab. Once the milling unit receives the impressions, it begins to craft the restoration from a seamless cube of dental-grade ceramic. Once the restoration is complete, we place the final product all in one visit.